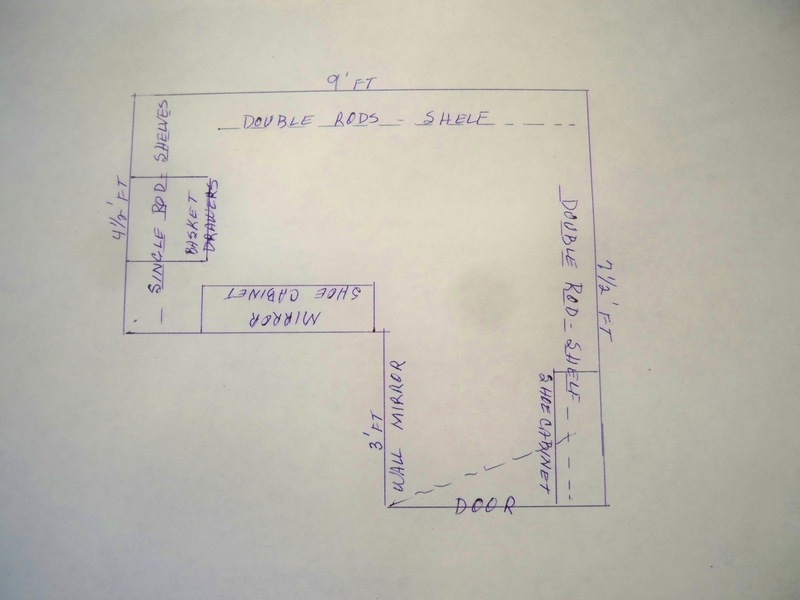 I get so many comments about my new walk-in closet. 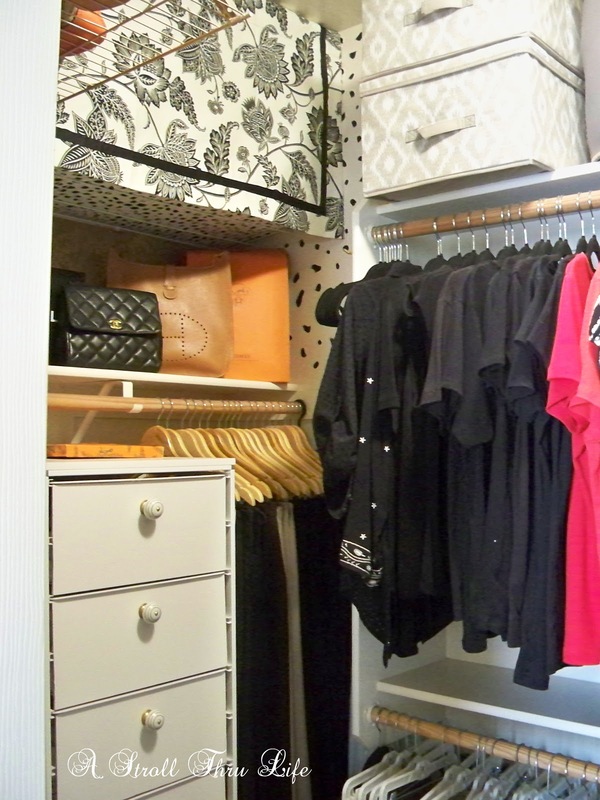 Seems like you guys all love a pretty closet as much as I do. 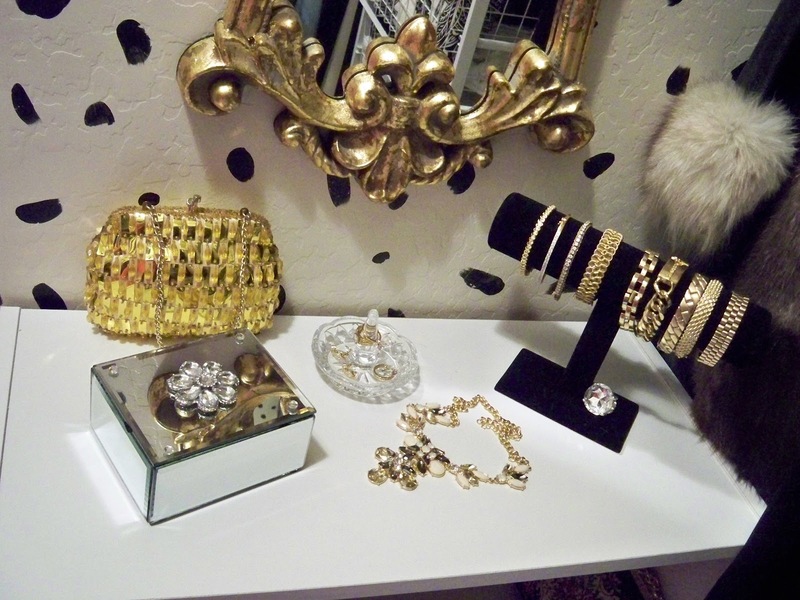 The one in our new house didn't get a makeover, it just got a few accessories to give me a primping station. The one in our last house is the one that got a total makeover. 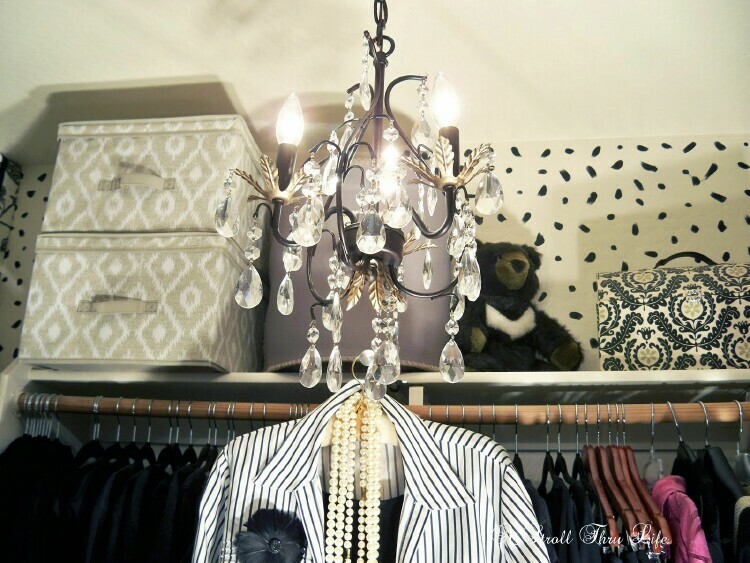 It is one that you could copy a ton of ideas from to take a small walk-in closet and maxamize it's space plus give it some character and glitz. I thought I would re-fun the reveal post since it was several years ago and and a lot of you might not have seen it. 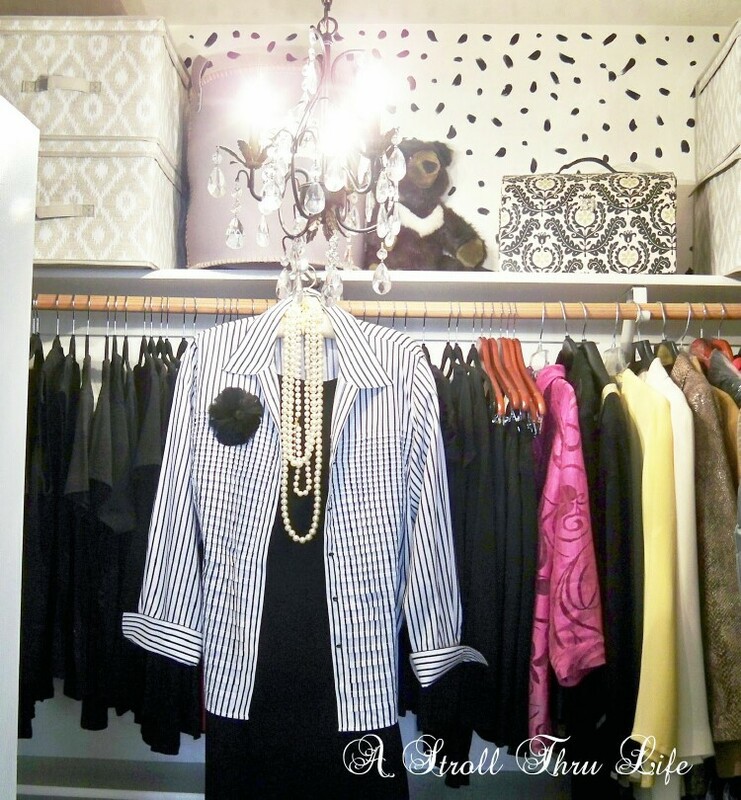 Hope you get inspired to jazz up your closet. With everything out I decided to give the walls a little fun treatment with some "Dots and Dashes". 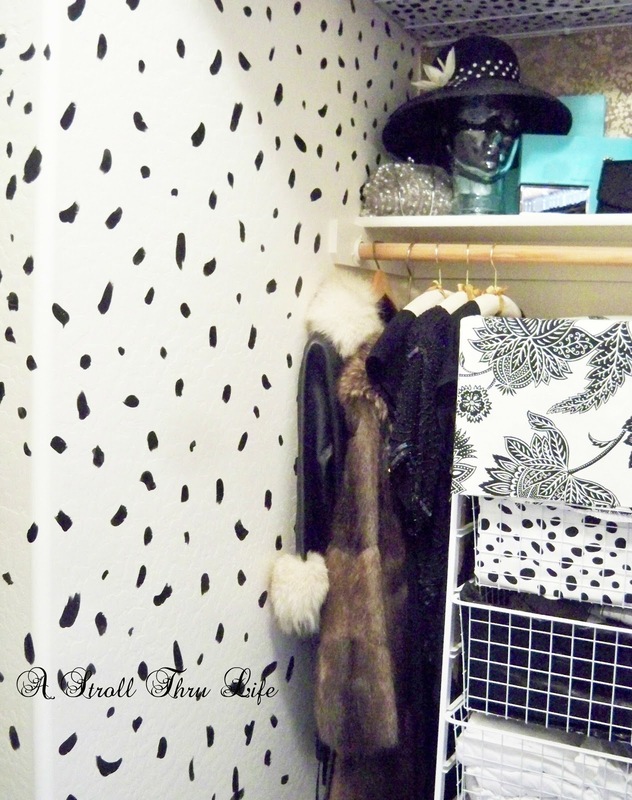 (Check out my simple tutorial for how to do this wall treatment.) 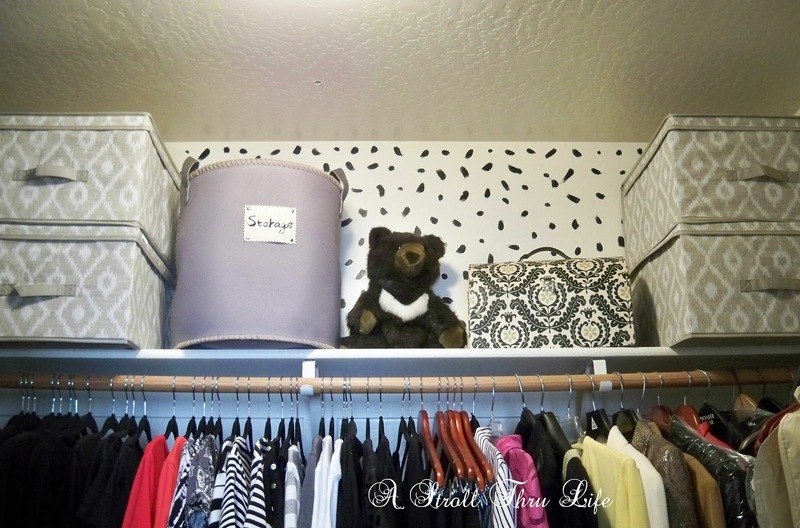 Storage boxes and bins were next to help add a little "Pretty" and organize seasonal clothing. 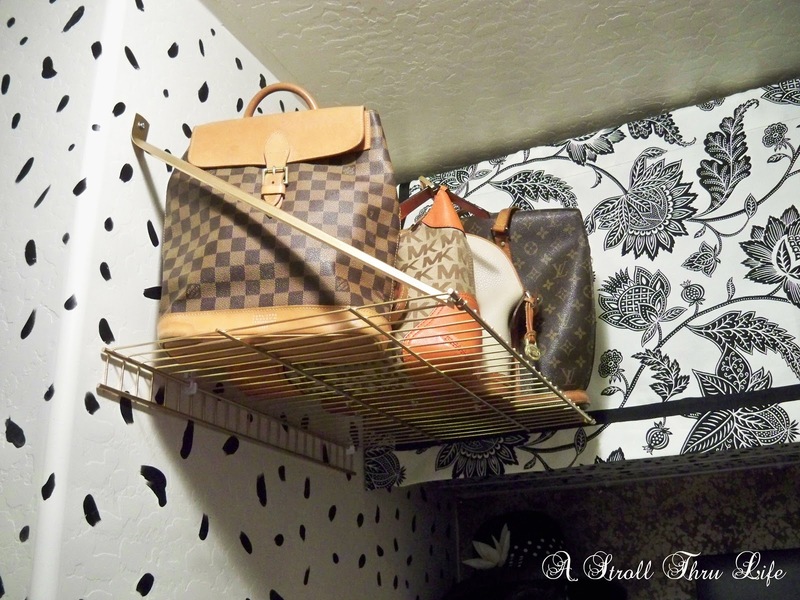 When the clothes went back in they were switched out to beautiful slimline velvet and wood hangers. 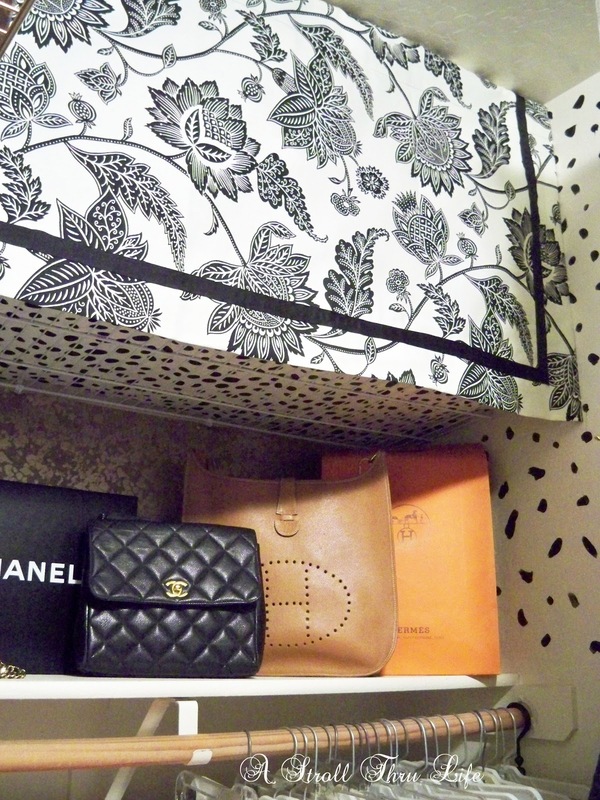 it was time to conquer the left side nook of the closet. What a lovely makeover. I really like the whole thing. 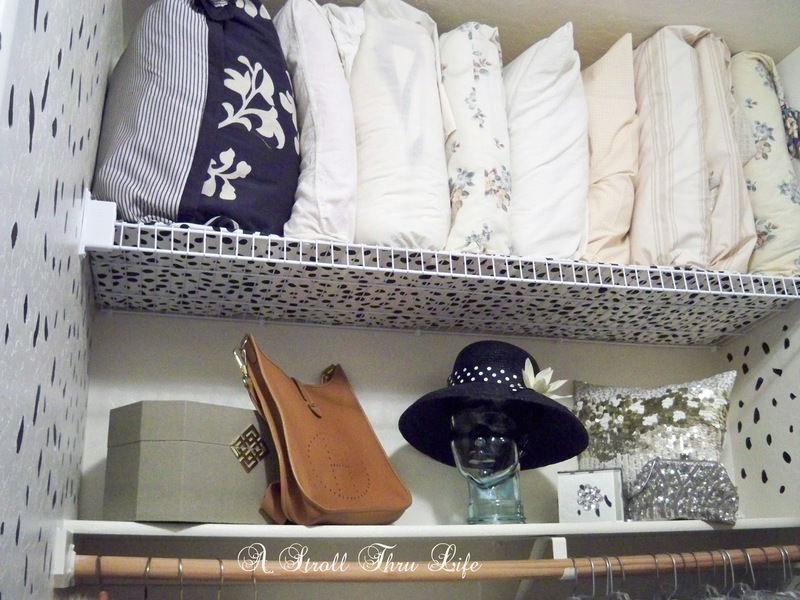 I am curious as to how your husband fastened the masonite drawer fronts to the wire baskets. I think I like that part the most, actually, because the baskets always look sort of messy otherwise. He just placed a washer behind the wire grid and used to drawer pull to screw it on. 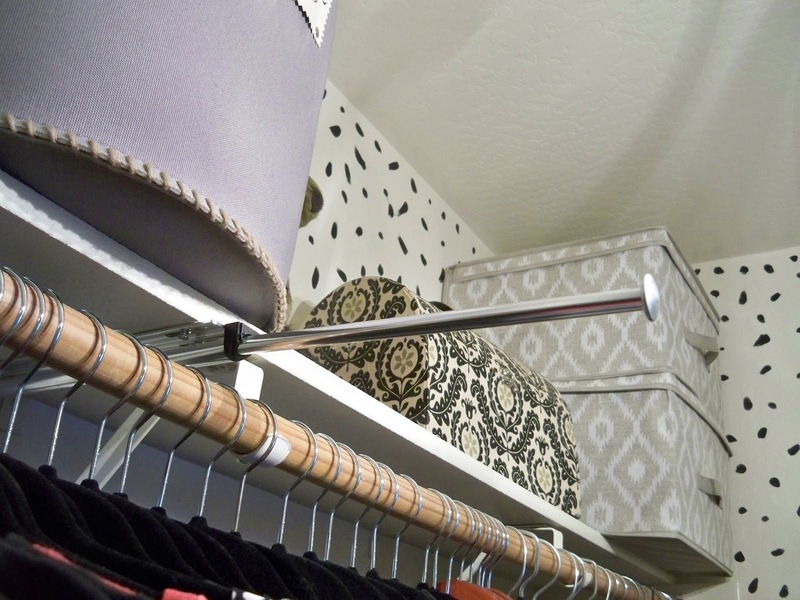 It is held on by the drawer pull attached to the basket. 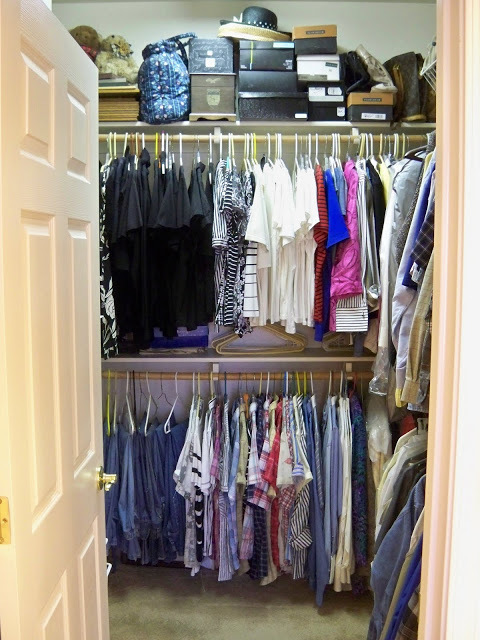 Walk-in closets are wonderful but sharing can be a nightmare. Just kidding, but I do like how you and Hubby are cooperating in this endeavor. Beautiful results. I'm afraid ours is more functional than pretty right now. What a difference, Marty! You really took advantage of every single inch, and made it fun and glamorous at the same time!! OMGoodness, Marty, I wish you could come do mine. I am sure I have too many clothes, it is just so hard to get rid of them. When I do purge, I usually give them to a church nearby who has a very poor population. They even take linens etc. I pinned this to refer to also. We are home now. What an exhausting trip. Have a great rest of the week. I'll try to catch up on your past posts while we were away. My closet is a disaster. Thank you for this inspiration! 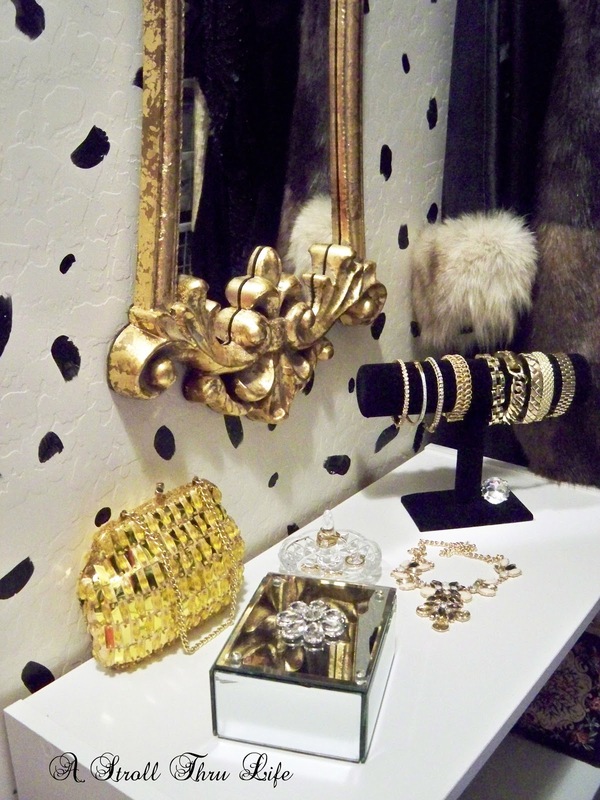 Your closet is fabulous! You have inspired me to take another look at mine to see how I can make a fashion statement. Thanks for linking up with The Creative Circle! Oh my gosh! Marty! 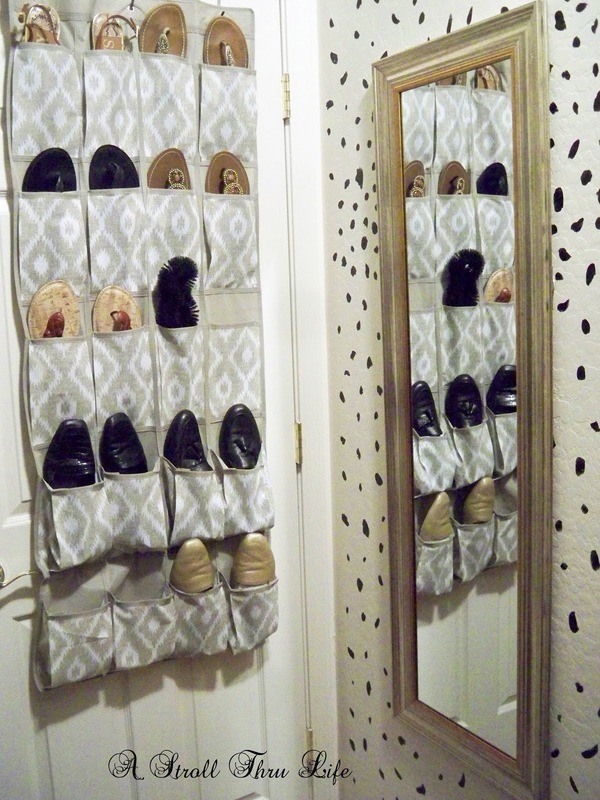 You did an amazing job with your closet makeover. 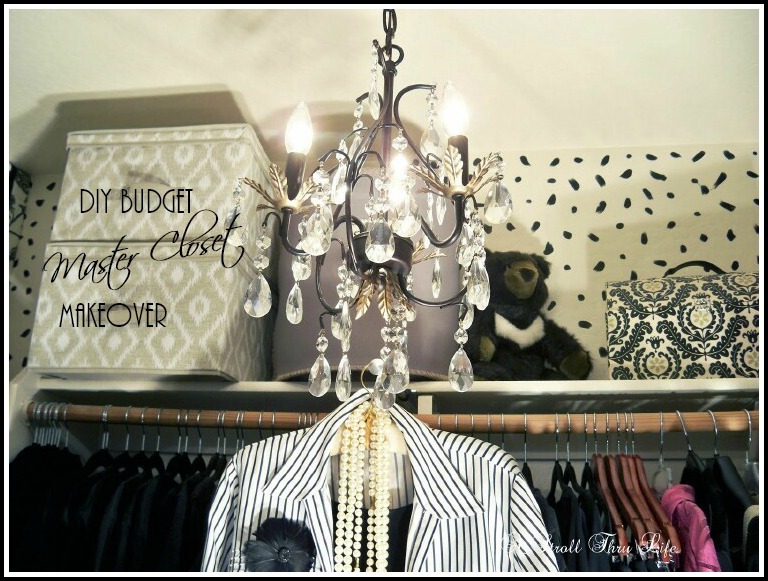 So many great ideas here and budget friendly too. I love it. 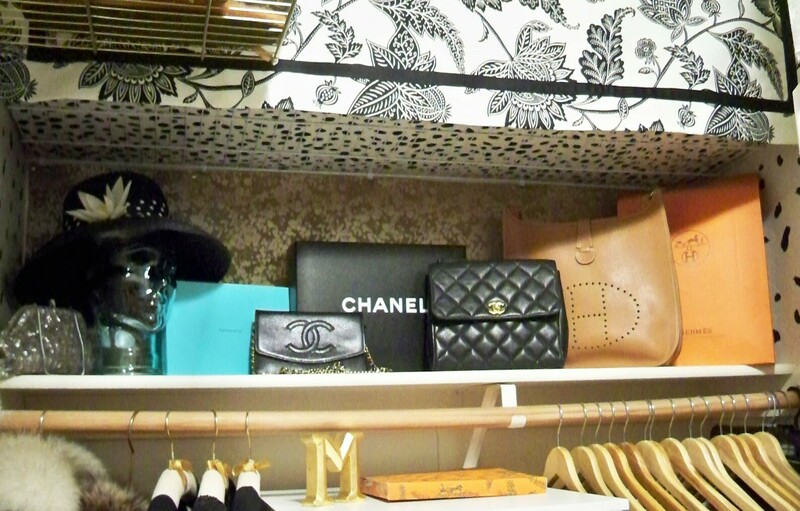 My closet is similar to yours so I can totally see a makeover happening in mine now that I've seen what's possible. Thank you so much for sharing your talent. 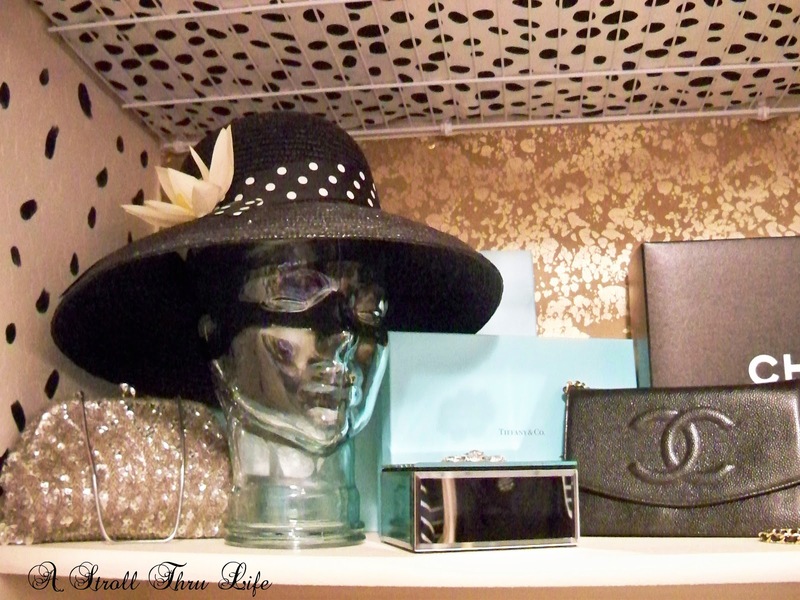 I so badly need to purge in my closet. 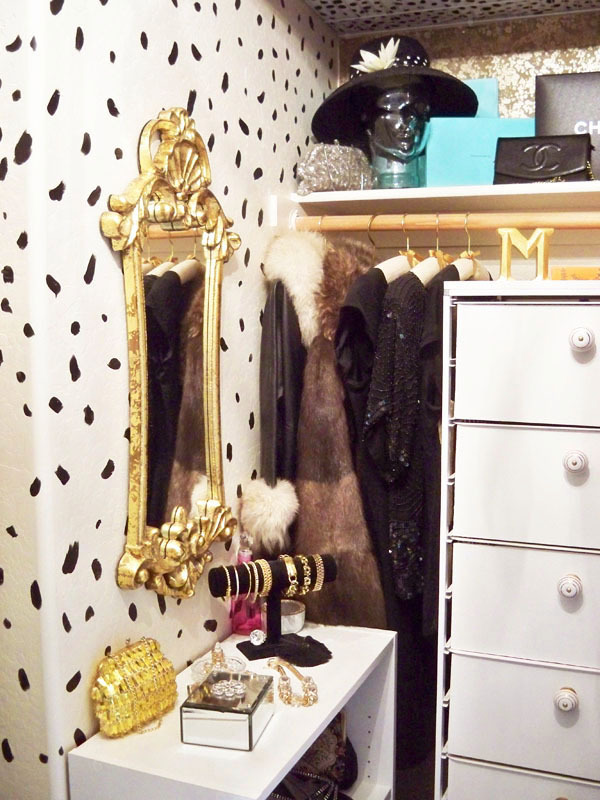 Your beautiful closet is fabulous inspiration. Maybe I'll get busy in mine after seeing this. Thanks for the inspiration, Marty. Marty, you are so creative with space and decor! 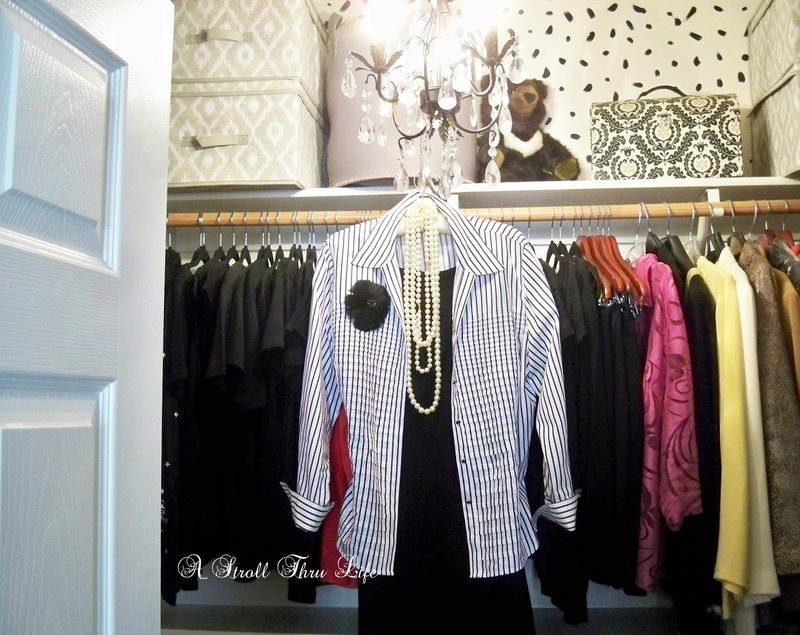 I love this closet! 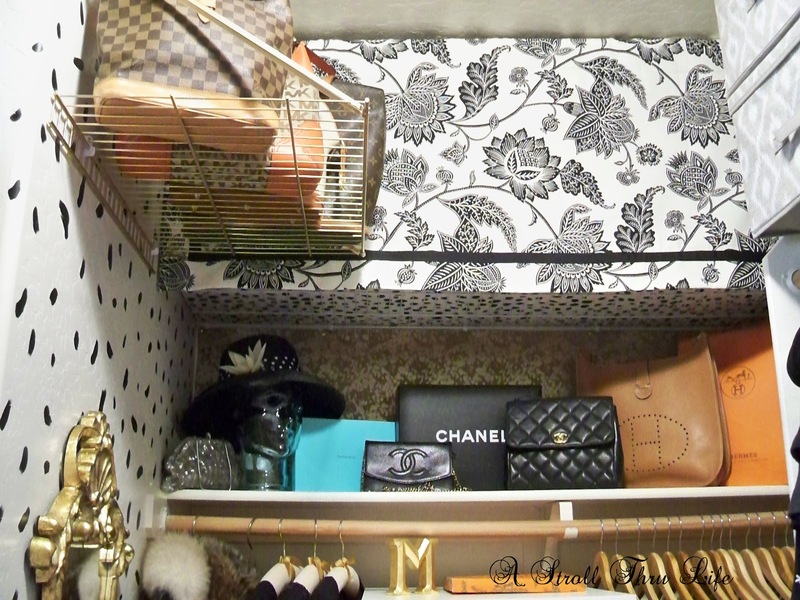 I love how you use every space of the closet! Thank you very much for sharing the details of the project! 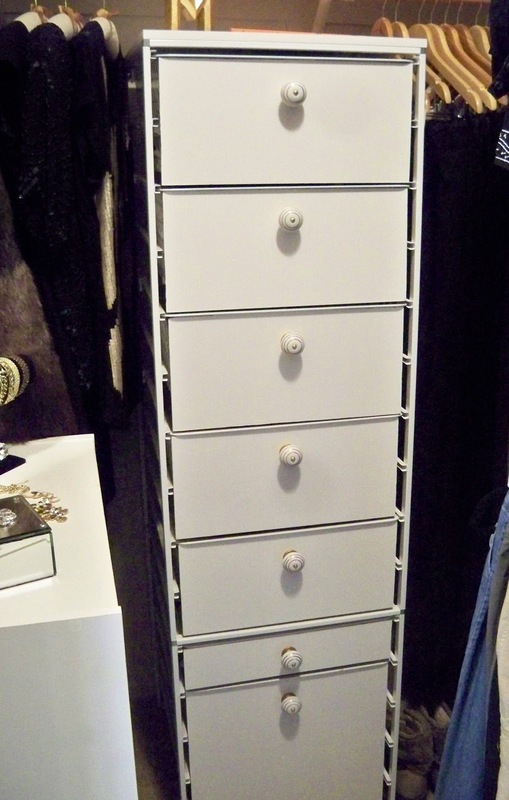 I find it so inspiring to see how even ramping up a closet can make a woman feel special. Makes me want to wallpaper mine! That telescoping rod is a great idea! Thanks for sharing at Home Sweet Home.